A native Rhode Islander, Dr. Picard grew up witnessing health-related issues with his family, always believing there was a better way of achieving good health. His personal story of chiropractic began with his mother. When Dr. Picard was a teenager, he saw his mother go through many health-related challenges, one of them being low back pain. Seeing his mom regain her health through chiropractic care was the motivation that got Dr. Picard interested in chiropractic medicine. After attaining his undergraduate pre-med requirements, he attended the National University of Health Sciences and graduated as a Doctor of Chiropractic in 1990. After being in practice for a number of years, Dr. Picard went back to school and attended the University of Rhode Island’s Nutrition and Food Sciences program. He also attained a national certification as a nutritional consultant from the American Association of Nutritional Consultants. Through chiropractic care and nutrition, Dr. Picard has helped thousands of patients live a pain free life. Dr. Picard’s patients are people that see the value of chiropractic care and nutrition for a better quality of life. Supporting the body naturally will give the body the advantage it needs to overcome many health related challenges. Dr. Picard is passionate about his work and will ensure that you’re getting the best possible care. He is always working in your corner with the best approach to help your body recover from any issue you may be having. Ultimately, everyone needs someone to manage their health, but more importantly, someone to look at the big picture when it comes to managing their spinal health. Dr. Picard has the expertise to help you on your quest for getting to the root of your spinal health issues. With that said, we encourage you to schedule an appointment today. This is a good first step to connect with someone who is truly interested in helping you. I am a avid tennis player and I see Dr. Picard on a regular basis to keep me healthy and on track with my game. He has definitely helped with any sports injury that I have had in the past. I highly recommend him! Dr. Picard has helped me with low back and leg pain where I am now pain free and back on track with my life again! I highly recommend Dr. Picard if you have any type of back pain. He definitely gets you feeling well in a short amount of time! I highly recommend Dr. Picard to anyone who is seeking quality healthcare. He is knowledgable, patient and caring, which is very hard to find in our world of conventional medicine. There are many doctors in this world that say they are there for their patients, and there are doctors that really are there for their patients. Dr. Richard Picard is that doctor who is there for his patients. I just needed someone to take that “extra step.” Dr. Picard was the one and only person to find a solution and end 13 years of suffering. I am forever grateful to this person who truly listens to and sincerely wants to help his patients. Thank you, Dr. Picard! 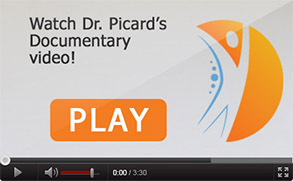 Take the first step to better your health – let Dr. Picard help you.